I typically end blog entries with a quote that is relevant to the post. Today I will work in reverse by beginning with a quote from one of the greatest coaches in the history of sports. I couldn’t think of a better quote to summarize the impact that CT Fletcher has had on the exercise community in 2013. I first posted a video of CT Fletcher back in January of this year. At the time, most people didn’t know his name. The title of the video was even The Strongest Man You’ve Never Heard Of. Only a few old school lifters that I know remembered him from his early competition days. Less than one year later, CT Fletcher has become a household name amongst lifters. He has inspired people from around the world to do more and better work. There’s been times I listened to his rants at night and got so fired up that I had to bust out a few sets before I could calm down enough to sleep. He is one of those rare individuals who spreads his passion verbally. It is contagious. He gets people up and moving. Yet what I like the most about his success is that he isn’t preaching a single system to all. I honestly don’t know how CT Fletcher trains. Aside from watching a few videos of him lifting and hearing a few of his suggestions, I don’t know much about the specifics of his weekly schedule. I don’t need to know. The lack of instruction is actually what speaks volumes about his example. Almost anything works if you are willing to work, so when someone gets you to do more work, you improve. It’s not rocket science and CT Fletcher doesn’t pretend that it is. He has inspired people from all walks of life to work harder than they did previously. He has inspired athletes from different sports and lifters with different goals. You don’t need to train like CT Fletcher to benefit from him. In many ways, his verbal delivery is a modern example of Vince Lombardi’s classic quote from above. Trainers with knowledge about exercise are a dime a dozen, but not all trainers are able to inspire their athletes to do things they wouldn’t otherwise do. People have benefited from CT Fletcher’s advice without being told what to do. He doesn’t need to stand over you with a clipboard, count sets and reps, and critique form to get you working harder. In fact, one of my favorite videos from CT Fletcher is one where he discusses a few intangibles that are relevant to success (see below). He is not telling anyone what to do. Instead, he discusses mental aspects that are relevant to athletes from all sports. And once you understand and apply these mental aspects, you’ll realize that you can do well with almost any type of exercise. I may sound like a broken record, but I’ll say it again. It’s not what you do, but how you do it. I view CT Fletcher as a welcome smack in the face to what is often a deceptive fitness industry. Far too many trainers say what they think you’d like to hear rather than what they truly believe. CT Fletcher does the opposite. He speaks his mind without worrying about whether you’ll be offended. He is real. There is no denying his authenticity. He doesn’t pretend that you can build arms like his in 30 days. He’s not telling you that you need to perform a specific number of sets or reps. He’s not telling you that you need a particular piece of equipment. He’s not preaching a rocket-science formula for success. What he is doing is sharing real world experience, which is unfortunately missing amongst many in today’s era. CT Fletcher is rare in that he actually walks the walk. He has been lifting for longer than some of the new-age gurus have been alive. He speaks about things he has done, rather than simply talking about what he’s read. You may not like CT Fletcher’s language and I’m sure I’ll get complaints after posting this entry. It happens every time I share one of his videos. Fortunately for me, I don’t care if you like his videos. We are all entitled to an opinion. Mine happens to be one that agrees with CT Fletcher. I’m not here to tell you what you should enjoy. I do however believe that he’s the best thing to hit the exercise community in recent years. I wish everyone would speak with his honesty rather than always riding the coattails of whatever is popular at the moment. 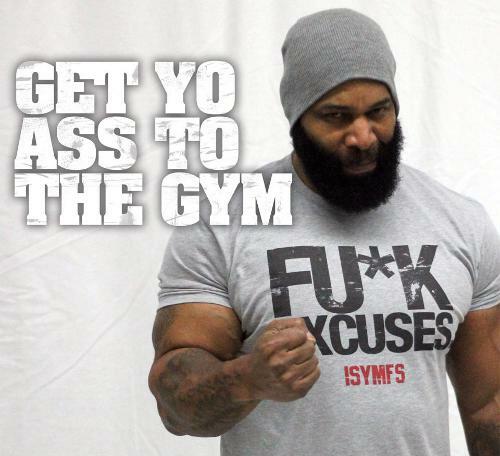 The fitness world needs more CT Fletcher and less of the keyboard warriors that type about things they’ve never done. We’ve reached the point where you can become an online expert without actually doing anything. How did the industry become so pathetic? Like him or not, CT Fletcher practices what he preaches and has helped people around the world. That alone puts him well ahead of your average fitness guru. CT and Ross are the two most motivating and straight talking guys in training today. Ross, I truly follow you on this one (and all of your other posts :-). The industry (and all commercial bs) give the impression that fitness (and weight loss) can be achieved with minimal effort. Just by taking a pill or using some kind of high tech product. The truth is that it takes dedication and perseverance to get or become what you want. Everyone who has tried it knows that, whether you failed or got what you wanted. Keep it up for the new year. You’ve got my vote 😉 Thank you! Hi Ross, Love what you guys are both preaching: Keep it simple, and learn from those who have been there and done it, there are no short cuts. Love CT Fletcher, his message, and the fact that you posted this about him. As always Ross, Great and inspiring post. Couldn’t agree more. CT is the TRUTH. I have met him and workout him and he is very motivational. Great post as always and very relevant to me at this time. Best wishes for the New Year to every one that follows this site and especially to Ross and his family. I think his message is so needed and applicable even outside the world of fitness. That kind of honesty and integrity is very inspiring… Only people who live by those qualities are able to motivate others like in the Vince Lombardi quote. Thanx Ross. Just what I logged on here to get. Gonna layer up, put on a hat, go into the garage and do it. First workout of the new year. Yay!! Ha ha, Ross asks how we reached this point in the industry that’s so pathetic? Money rules (which is fine), and people are naturally lazy (which is not). That’s how. Anyway, there are times now that I tell myself that it’s still my mother @#$#$% set. Or rep, if I need one more. There are other times in my head I tell the weight I’m mad that it’s not heavy enough like his one video about arms, he’s going on and on, saying this is what goes on in his head. Motivational, at least. I love the guy. Every word set in stone. I was also introduced to CT through you, Ross. Thank Odin for both of you, for keeping this precious aspect of life real and honest. I had to re-read this post Ross due to the rising popularity of CT. I always knew who he was and his accomplishments. You hit the nail on its head. I agree with CT’s message. I just dissect the bad language from the message and agree wholeheartedly with what he is trying to convey.